And here we go with Round 2 of Makati Shangri-La’s Giveaway. Up for grabs: Vouchers for two people to Circles Event Cafe. To the winner of the previous giveaway: Congratulations! This Rafflecopter Giveaway will be for the second set of two (2) tickets to Makati Shangri-la Manila’s One Grand Buffet (Week 2) . Please also read Terms and Conditions below. Vouchers are valid for use until March 3, 2014. This promotion is in no way sponsored, endorsed or administered by, Makati-Shangri-La, and that the vouchers are complimentary vouchers given to Lynne-Enroute.com for its use. We hereby release Makati Shangri-La of any liability. Only residents of the Republic of the Philippines with a valid mailing address are eligible for this entry. Winner(s) will be declared at the En Route Facebook Page within 48 hours after the giveaway ends. The winner is asked to send a private message pertaining where the vouchers can be mailed. In the event that the winner does not respond within 48 hours with a valid mailing address, the prize will be forfeited and a new winner will be drawn. 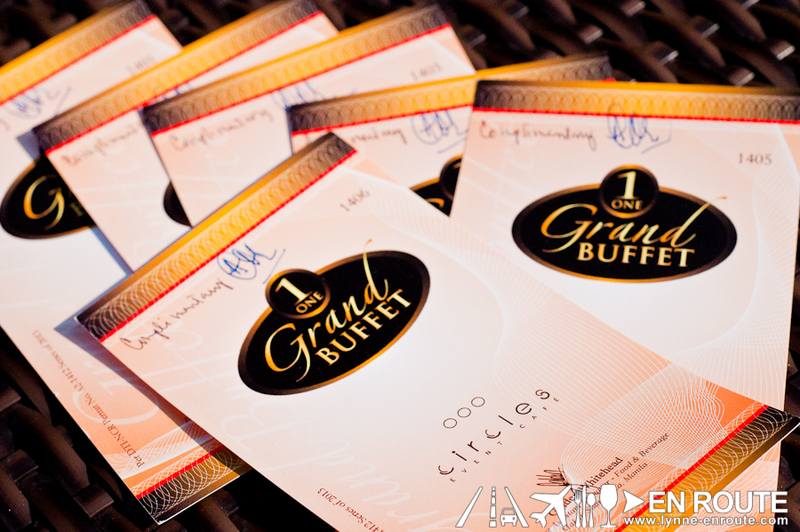 Previous winners of any Makati Shangri-La One Grand Buffet giveaway by Lynne-Enroute.com are not allowed to join. Any winners that have listed in such previous giveaway will be disqualified. Lynne-Enroute.com reserves the right to disqualify, forfeit, or revoke any winners discovered to have not followed the mechanics or the Terms and Conditions, or have committed fraudulent, coercive, illegal, and unethical acts to obtain the prizes for this giveaway.